It's 1991 in Massachusetts and Connie is a Harvard graduate student studying history when her mother phones and asks for a favour. After reluctantly accepting, Connie travels to Marblehead (near Salem) to put her Grandmother's affairs in order and sell the house. The neglected house has been empty and locked up for decades and is partly concealed by the out of control garden. When exploring one of the dusty bookshelves, Connie finds an old key hidden inside a family bible. Hidden inside the key is a tiny piece of parchment with Deliverance Dane written in script. Connie is curious and begins a lengthy search to find out more about Deliverance Dane. Meanwhile, the book alternates between 1991 and the 17th Century where the reader is thrust into the lives of Deliverance Dane and her descendants. Connie discovers that Deliverance Dane was accused of being a witch during the time of the Salem witch trials, and thanks to a legal document referencing a recipe book, Connie starts to track down this physick book. Will it contain remedies to cure ills and sickness or will it contain magic and spells? Connie's advisor is obsessed with the study of alchemy and is after the book for his own twisted reasons and a Steeplejack enters the scene who may be able to offer some help. 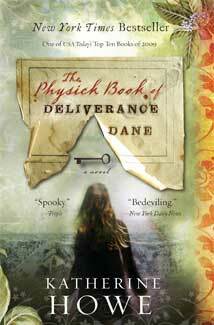 The Physick Book of Deliverance Dane is part mystery, part historical fiction and I would have preferred more time spent in the 17th Century. This is a contemporary novel with a hint of magic and it will appeal to many readers. I enjoyed this book immensely but like your good self, I wanted to see more of the story in the 17th century. Hi Paula, it's interesting when publishers change book titles in different countries, determining which title will sell more books. I'm glad you enjoyed this book as much as I did, it was a great read. THE PHYSICK BOOK OF DELIVERANCE DANE has it all: believable characters, a love story, friendship, and family connections as well as curses. It is a well-written first novel that weaves the author's personal ties with the era into an incredibly convincing story. Thanks for your comments Danmark. Author Katherine Howe has published another novel 'The House of Velvet and Glass' released this month (April 2012). It is set in 1915 and may be worth checking out.